There is a strain of melodic punk rock that certainly wasn't invented by either Iron Chic or RVIVR, but those are the two active bands that I most associate with the sound. Considering that the band contains a member of Iron Chic and a member of RVIVR, it probably shouldn't be a surprise that Tender Defender does kind of fall right into the middle of this strain. If you are familiar with either Iron Chic or RVIVR (or Tender Defender's other precursor band, Latterman), you'll probably be pretty content with this 12" EP. 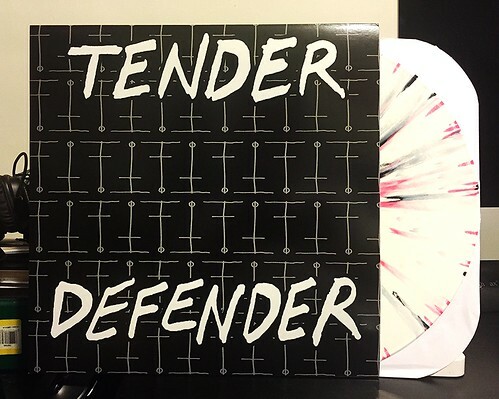 While I have never been a fan of the 12" EP as a format (I'll take a 10" every time as my personal preference), Tender Defender certainly make the most of their time and leave you clamoring for more songs. Tracks like "Hello Dirt" and "f.e.f.e." feel like home with their fast and powerful guitar work and sing along choruses. It's hard to not imagine a group of people at a Tender Defender show with their fists in the air singing along to every word. Even when the band slows things down and takes some chances on longer songs like "Rudes and Cheaps," they still hit it out of the park. Now, I am going to take some points away for the band having a song called "The Tender Defender," as I've never liked it when bands have songs with the same title as the band name, but I don't have anything bad to say about the song itself. It's another solid entry on this 12". Tender Defender has come storming out of the gate with a debut that is really worth checking out. Hopefully it's the first of many releases and not just a one off side effort in between the member's main bands.